Longform’s guide to the greatest hits of the late, great alt-weekly. Courtesy of the Boston Phoenix. The end of The Phoenix, announced Thursday, hit us hard. We’ve been fans of the legendary Boston legendary weekly for a long time. (Some of us remember well that day in the late ‘90s when the paper went free.) 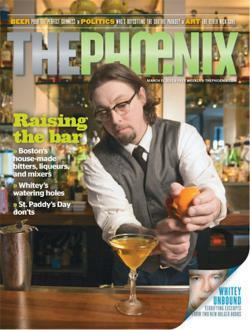 The number of great writers that passed through The Phoenix—Susan Orlean, Jason Gay, David Denby, etc.—is remarkable. We bid adieu to a great paper with a look back at some of its greatest stories. On heading home for Thanksgiving. A comatose from Worcester, Mass., is the catalyst for a string of miracles and becomes a tourist attraction. “Her name is increasingly well known in the circle of people who follow miracles. ‘She’s new. I think she just became popular in the last year or so,’ says Jim Drzymala, administrator of the ‘Apparitions of Jesus and Mary’ Web page. Those who can’t jump the line by virtue of chronic disease take what ancillary contact they can get; once a year, on the anniversary of her near-drowning, Audrey is wheeled into a local church to receive the faithful. Last year, as Audrey lay in her tiara on a stretcher, this Mass attracted upward of 5000 people—a crowd so large, and so unexpected, that ‘the police could not respond appropriately,’ according to city councilor Wayne Griffin. What really happened at the World Trade Organization protests. “It’s easy to see that a situation’s developing. The protesters are everywhere; the delegates are shut out of their meetings; many of them, including the US representative to the WTO, Charlene Barshefsky, can’t even get out of their hotels. What’s more, the big protest—the labor march, with more than 30,000 people—hasn’t even started yet. It’s not even nine o’clock in the morning, and authorities are losing control of the city. Did He Murder His Mother? The jury made a mistake when it convicted Abdul Raheem. “The state medical examiner was never allowed to enter the crime scene—another peculiar aspect of the investigation. That examiner, Alexander Chirkov, testified that he came to the crime scene the first evening and stood waiting outside the house for half an hour, but was sent away. Chirkov performed the autopsy at 10 a.m. the next morning in his lab, a delay, he testified, that denied him access to information that could have allowed him to pinpoint the time of death, and perhaps to discover other important information. What’s a suburban soccer mom who was once fervently anti-drug doing running a business growing and selling pot? “From the outside, we could have been on Wisteria Lane. But none of their neighbor’s houses are visible through the trees that surround Mary and Joey’s abode. “We walk into a neat, clean, sparse home. There are no pit bulls, no guns, no security cameras. No henchmen, no gangsta rap blaring. No heavily tattooed and pierced punks or hippies. It is, in fact, the exact opposite: a quaint residence, quintessentially suburban, with a bowl of plastic fruit on the dining-room table, pictures of their happy family on the walls, house plants in the windows, and a bird feeder in the backyard. Smokey, the house cat, lolls in the living room. Naffe, a young Republican, entered the belly of the political beast—and was nearly eaten. “After a long cruise through wooded Westwood, O’Keefe pulled up to Naffe’s accommodations for the night: a two-story barn on the property of an upscale suburban home. Naffe says details of their destination were not made clear on the ride, but it didn’t take long once they arrived for her to realize that she was inside Project Veritas headquarters. There were awards on the wall with O’Keefe’s engraved name on them; equipment from the RV in Los Angeles was set up on a desk. With contributions pouring in, O’Keefe had invested thousands on computers and surveillance equipment. His renovated barn was a full-service bunker for waging war against liberals.